You can run the MQTT gateway on an Arduino+W5100 ethernet module or the ESP8266. Connect radio and ethernet module exactly like for the normal gateway. You can test your gateway using mosquitto as broker. Make sure to set MY_IP_GATEWAY_ADDRESS in gateway pointing to you computers ip-number (on the same lan). My sketch was able to subscribe and publish to the mygateway topic. but my gateway was not able to receive anything from "mygateway1-in" but it was still receiving from "mygateway". but still not able to send or get anything from "mygateway1-in" or "mygateway1-out"
I get a st=fail error. Any help would would be appreciated. I am unable to find this anywhere in the mysensors library files. I find MY_MQTT_TOPIC_PREFIX in MyGatewayTransportMQTTClient.cpp, but that is it. Should MY_MQTT_SUBSCRIBE_TOPIC_PREFIX not be there also? Had to let the pull request containing MY_MQTT_SUBSCRIBE_TOPIC_PREFIX /MY_MQTT_PUBLISH_TOPIC_PREFIX build before merging it. Now it's in place. "st=fail" means that your gw doesn't receive any ack on the sent radio message. Thank you for the quick response. Do I have to recompile all my sketches using the dev branch? Right now all my sensor sketches are compiled with version 1.5. Everything works fine with my serial gateway. When I do my testing with the ESP MQTT gateway I turn off my serial gateway to avoid conflicts and when I restart one of my sensors it sends the sketch version and it presents its self and I see this in the gateways serial interface and I also see it in mosquitto. My sketches seem to have no problem sending to the gateway, but the gateway does not appear to be able to send anything to the sketch. Do I have to recompile all my sketches using the dev branch? Right now all my sensor sketches are compiled with version 1.5. I remembered that ack is disabled on my sketches, as I did not see a point in using it with the serial gateway connected to node-red. I will recompile my sketch with ack enabled. Not the same type of ack. This is the one sent automatically by the NRF radio. You can't disable it in sketch. The only thing I have not done was compile the sensor with the library in the dev branch, but I was under the impression I did not need to. @ahmedadelhosni That worked, I can now send messages from my gateway. @Mike-Cayouette Glad that it worked. Please note that these would be temporary workarounds for MQTT support only. I guess that won't work if the sensor node is far away from the gateway and needs a repeater in the middle, because in that workaround you don't check your look up table. @ahmedadelhosni I have not had to add any repeaters to my network yet so I should be good until a more permanent solution is worked into the library. Thank you again for you solution. @hek Do you expect a more permanent fix for this solution to be pushed to the dev branch? Ok, verified sending a message to a node here now when repeater mode is enabled. Works fine and message is received. Here is the change I made. Soon merged into development. Great work. I use an ESP8266 12E, and it works just fine. All though this topic is related to the development branch, has the topic structure been fixed (except for prefix)? @hek What about the first issue which I reported about ? Still returns TRUE and returns. // Message not for us or malformed! Is it reproducible at your side ? No, I couldn't reproduce any problems with topic naming. I use the default subscribe/publish prefix in the sketch and can send messages without any problem. Have we managed to get a MQTT Gateway working on a Arduino with an ENC28J60 module rather than a w5100? I didn't bother trying. The ENC-library is gigantic and the MQTT implementation used does not support the ENC-module. @samuel235 I don't really encourage you to use ENC. I spent months trying to make it stable and I failed. There are several manufactures and as far as I know that there are several software workarounds to fix problem in the silicon chips. I turned to use W5100 and it is much better till now. N.B. : Some people managed to run ENC with good stability but as I have said, there may be different manufacturers so I got confused and tried the W5100. @ahmedadelhosni I have now turned to the W5100 shield myself. Works a charm, super smooth! Sorry haven't seen this error. Which ESP board version do you have installed in the IDE? (See Board manager). Please do no double post on the forum! Only creates annoyance. i comment the lines in MySensors/core/MyMainESP8266.cpp and it compiled ok. This has been fixed since a while back. I tried the development branch because I prefer having my gateway not as message broker. I use the w5100 version of the sketch with a static IP. 1450112394: New connection from 192.168.100.10 on port 1883. 1450112394: Socket error on client <unknown>, disconnecting. 1450112409: New connection from 192.168.100.10 on port 1883. I had a similar problem a while back, not with the mysensors dev branch, but while using the subpub MQTT library on a ESP8266. After upgrading my MQTT (mosquitto) server to version 1.3.5 it corrected to the problem. You may want to take a look at the version you are running. I'm trying to set up the MQTT gateway to work with Home-Assistant; since the serial gateway plugin lacks in binary switches (ex relays, and other things). I have the MQTT sketch installed on a Nano with W5100 module, and serial output from the Arduino is good. But when I add a sensor to the Gateway, there is no communication. Here is my output from Arduino, where would I go next? I'm still interested in the reason. Hardware broken or wiring fail? => basic networking seems to work, but "delivering content" failed. Any guesses? @dakky I guess I had that problem once or twice before but I don't pay attention to it as there was other bugs which were more important. I remember that I just reset the nano and it worked at once. Glad that it worked for you but as you have said, knowing the root cause it important. Will try to reproduce it again when I have time. mean, that the consuming controllers configuration (openhab in my case) has to be changed? in order to represent what is really pushed to the mqtt broker? Because thats what is posted to the broker? A little bit cofused. Can this sketch be uploaded to ESP12 set as in the "ESP8266 WiFi Gateway"? Without the arduino? Can more detailed instructions be given on the development branch? As i understand this is not a simple copy the code from here https://github.com/mysensors/Arduino/blob/development/libraries/MySensors/examples/GatewayESP8266MQTTClient/GatewayESP8266MQTTClient.ino paste into arduino IDE compile and upload process? Yes, after the MySensors library has been installed you should be able to compile/upload the sketch and run it. Well i had to move all the libs from production branch and extract clean only the development branch in arduino IDE to get it to work. Arduino: 1.6.5 (Windows 7), Board: "Arduino Pro or Pro Mini, ATmega328 (5V, 16 MHz)"
\My Documents\Arduino\libraries\MySensors/MySensor.h:201:3: error: #error No forward link or gateway feature activated. This means nowhere to send messages! Pretty pointless. #error No forward link or gateway feature activated. This means nowhere to send messages! Pretty pointless. Is there some miscompatability betweed development/production branches? My humidity sensor reports in the serial console just fine. Please ignore the last post. Solved by finding out that Openhab doesn't handle Node ID assigning. As soon as one of the three LED PIN assignments is not defined (commented out), the Example sketch will lock itself after initializing NRF radio, and running DHCP. So, no further NRF communication nor signup at the broker. WDT steps in then. Just defining all three LEDs, without any other parameter or use the LED blinking feature, and everything is fine. Ive just setup a new MQTT client gateway ( from link at the top of this post..) and have a few nodes successfully sending data to a mosquito server. What im trying to now do is, using the RelayActuator sketch, is control the relay via a MQTT message...but im confused as to what i need to send it! So what message do i send it from another MQTT client ? How can i serial.print out all the messages it receives? as you can see no incoming messages from mosqutto. So looks like i need to add an extra level to the message i send! and now i can see in my serial outputs of both the mqttclient gateway and the relaysketch node the message received! Hope this helps someone else! That thread does not directly touch on the issue I noticed, although that might be connected. Why is the topic structure as it is? I like my MQTT topics in hierarchical order. So, having different prefixes for send and receive (in and out) is not nice, but ok. BUt why is the ACK flag before the data type, which is usually linked to a value or variable in the sensor? I would consider ACK to be a sub-value of that one. And is there a way to have more speaky names instead of numbers? So, the source does not have that option and as that gateway is now included in the library I only see the possibility of changing the source in the library, which will disconnect from updates. Not nice. What about an option of excluding gatewayTransportSend and incomingMQTT via define from the library and define then in the own sketch? Also is it possible to use fqdn for the mqtt broker instead of the ip? I also tried to use DHCP and fqdn for mosqitto, but no luck....so I cant help but I too would like to know if its possible. I haven't verified it myself yet though. Finally I have the ESP8266 gateway running with Mosquitto and Openhab. Because the ESP8266 Gateway installation was painless and Mosquitto and Openhab the major problems I have posted some general info at this link in case anyone is interested, see http://forum.mysensors.org/topic/3005/switching-from-v1-5-mqtt-gateway-to-esp8266-mqtt-client-gateway. (Sorry if this is the wrong procedure but found no way to add other tags to a message in this thread). Thanks Hek - will give it a try soon! I have been successfully running the MQTT client gateway receiving the data from sensors. Now build the first mysensors relay and would like to know if the MQTT client gateway can act as a transmitter? mosquitto_pub -t mygateway1-in/55/1/0/0/3 -m "1"
Yes, it should work as a transmitter as well. What does the log say on gateway and node? Do not know if this info is of any interest but my ESP8266 MQTT gateway (based on a NodeMCU board) has been running without hiccups for almost a month now. So it has been very stable. I have also made a very short test using a Wemos D1 Mini for the gateway and this one seemed to be working as expected as well (not very surprised but you never know until it has been tested :-)). I've uploaded the GatewayW5100MQTTClient.ino to a UNO with W5100. I have changed IP adresses to my Mosquitto broker (on Raspberry Pi) as instructed. I don't see the gateway connecting to the Mosquitto (in the /var/log/mosquitto/mosquitto.log on RPI) and also I don't see anything in the serial monitor. I've got 10+ sensornodes that work well when using another gateway (to OpenHab). What am I overlooking here ? The same hardware UNO+W5100 worked before as MQTTgateway(+broker), so I'm guessing it's not the hardware? @DirkB19 If you do not see anything in the serial monitor for the gateway then the problem must be with the gateway itself. Have you observed that there is a special #define MY_W5100_SPI_EN to uncomment when compiling for an Uno with the shield installed ? If not, you can try that. Sorry for this NOOB question, but where is this to be uncommented. I don't see it in the gateway sketch ? Thanks for the help, but I'm still very confused because OK, I found the line to uncomment. I uncommented, but still nothing on serial monitor. In this case I think pin 14-16 are meant to be aliases for analog pins A0-A2. Read the build page for the Ethernet gateway. You have to wire the radio in a non standard way in combination with the 5100. But it's optional when using the shield. You could enable the SPI for that instead, like you were talking about a few posts up. 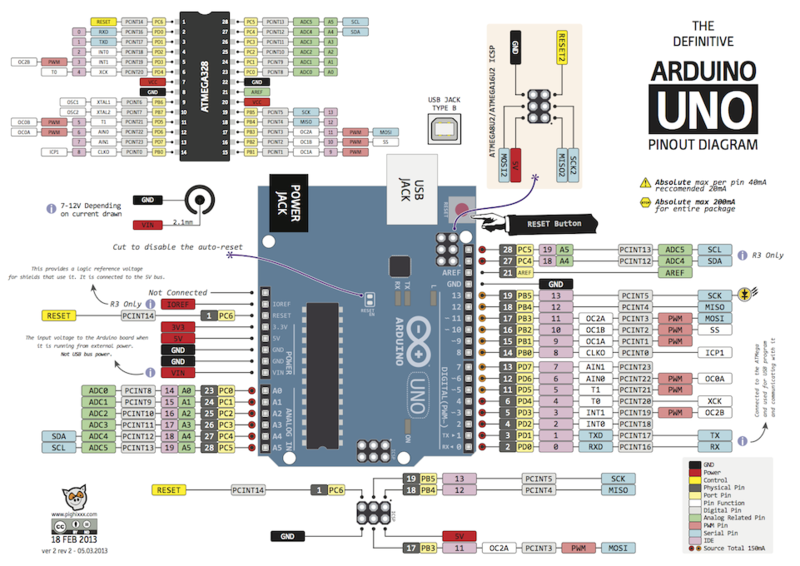 @DirkB19 The Arduino pinouts are, to say the least, confusing and it helps to look at one of the pinout sketches you can find on the net, for example http://marcusjenkins.com/wp-content/uploads/2014/06/ARDUINO_V2.png. So the pins are, as Martin said, (A0-A2) which must be exactly as you had them wired before if you had a "previous version" working MQTT Ethernet gateway. I have such a gateway (nowadays used as a spare) but built with a nano and a W5100 unit and it compiled and worked right away using the GatewayW5100MQTTClient.ino sketch from the development branch. 0;255;3;0;9;Radio init failed. Check wiring. So if you see nothing at all there is something really basic wrong. Presumably your sketch compiles OK so I assume you have exchanged all Arduino libraries to the libraries which belong to the Mysensors development branch. mbj gave me the right hint about using the development libraries !!! AND (!) you need to install the libraries from the development branch. I just hope that installing the libraries from development branch will not get me into trouble with my the rest of my nodes (upladed with 1.5). Is there an easy way to switch between 1.5 & development branch libraries when uploading sketches ? Anyway, thanks to all those who responded and special thanks to mbj. You can use git to easily change between different branches with libraries and sketches. The take home message from the first sentence in the top post of this thread, is that dev branch libs are required with this sketch. You should take care not to mix old style sketches with dev branch library and vice versa. Node to node to gateway comm should be OK as long as all nodes and gateway know the message types being used. I believe these examples are mostly referring to the older MQTT (Broker) Gateway. As @hek said in post #1 the client gateway resembles the serial protocol. The difference between the two is on the one hand a slightly modified topic structure and on the other hand that instead of names the topics make use of the number representation of the message types (see the Serial API). In your example you would have to use 3 instead of V_DIMMER as CMD-TYPE in your topic-configuration. If you are wondering whether there is a library which you can included in your items-file in openhab such that you can use the name representation instead of the values for the message type, then I am afraid I don't have a solution for you. I am, moreover, pretty sure that this won't be possible with the mqtt-binding but would require a specific mysensors binding for openhab. And for the better understanding - why were the inbound and outbound topics separated? Are there any drawbacks in unifiing when using openhab as a controller? If they weren't separated all outgoing messages would be looped back to the gateway. Update: I guess I was answering while @hek also posted his answer. I didn't do it, so I can only guess. But I believe this was done because otherwise the MQTT-topic would not include any information who the recipient is. This would on the one hand (1) make the GW send every message from a sensor back to the sensor and on the other hand (2) could cause infinite loops with controllers such as openhab. and hence receives it own message, which it then sends back to the originating sensor. Not only would this double the traffic in your radio network, it might also be problematic for bidirectional sensors, such as a relay, because it would also cause an infinite loop. The OH receives this message, updates the state of this item but also posts a message on the topic because of the item configuration, which would generate an infinite loop. If the sensor would do the same then we would have an infinite loop, in which the number of messages would double each iteration. Ok got the point. But in your example with the local button on the relay. How would one define the item in openhab? Seems two items need to be defined - buton with the gateway-in topic and a relay with gateway-out topic? And than implement a rule to update the relay status when the button state was changed? As otherwise the controller wouldn't know the state of the relay? I am not sure because I never did this myself but I would try to not only use the command class but also the state class in OH. Please be aware that this is just an idea. I never implemented this so far, neither did I test the code. The syntax could be wrong or it might conceptually not work. I use this gateway 2.0 and I'm very pleased with it, but...... I would like to be able to use it as a network gateway as well. Sorry if i shouldn't be bringing an old thread back to life, however it is a sticky and therefor I assume you guys would be okay with this being brought up to date. My W5100GatewayMQTTClient is in a loop, as shown below on the serial monitor, it seems to be reconnecting to the MQTT server every 8-10 seconds. Is this normal behaviour or not? I'm by no means asking for a solution (if i get one i will be sure to post here for others to revert back to if needed), but if you would like to suggest something, then it would be appreciated. I'm looking more for just a confirmation of if this is normal behaviour as of MySensors 2.1 or not. I used to run this client gateway back when MySensors V1.6 was in the development branch back in late 2015 and It didn't do anything like this back then.